Many of you are already trying Gmail’s new compose and reply function, available to explore today. The new format allows users to see messages in their inbox, search as they’re composing, write two emails at once, and in general interact with their inbox as if they’re using G-chat. Replies and forwards are confined to a tidier window. 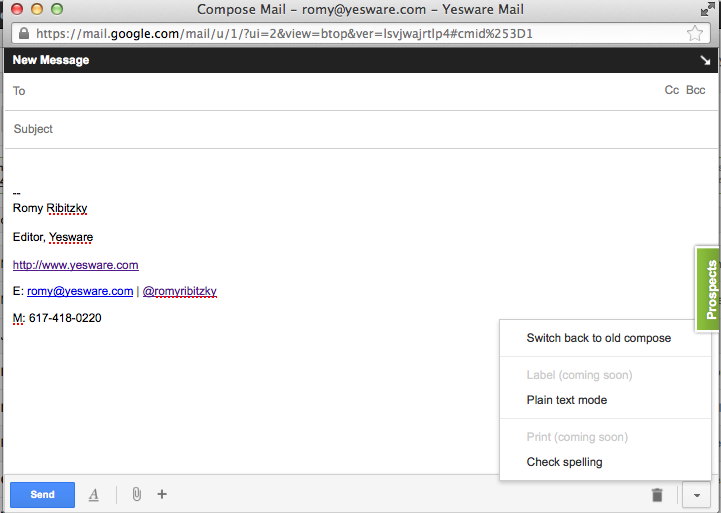 So how is Yesware integrating into the new Gmail environment? Our engineers and developers are hard at work designing a user-interface that will conform to the fresh features. In the meanwhile, to keep using the great Yesware features that help you close more deals faster, simply click “compose” as you normally would. You’re now ready to compose your message, use one of our ready templates, or select one of your saved templates. Choose a Yesware Follow-Up method and see how much faster you can achieve your goal. Want to track a reply? Hit “reply” and go to the bottom right corner. Click on the down arrow to bring up the drop-down menu to select “switch back to old compose” and reply as usual. For tips on Email selling and prospecting click here. And make sure to check out our helpful templates on keeping in touch and sending cold emails.